This model is available as an automated tutorial by selecting Model Examples and Tutorials... > Heat Transfer > Heat Transfer in a Ceramic Strip from the File menu. Or alternatively, follow the step-by-step instructions below. Enter 0.02 into the xmax edit field. Enter 3 into the Thermal conductivity edit field. Enter 900+273 into the Temperature edit field. Enter 50 into the Heat transfer coefficient edit field. Enter 50+273 into the Bulk temperature edit field. Enter 0.7*5.669e-8 into the Radiation constant edit field. Enter 50+273 into the Ambient temperature edit field. Evaluate the temperature in the points (0.01, 0.01), (0.01, 0.005), and (0.01, 0) and compare with the reference values Tref = 984, 1064, and 1088. Enter 0.01 into the Evaluation coordinates in x-direction edit field. Enter 0.01 into the Evaluation coordinates in y-direction edit field. Enter 0.005 into the Evaluation coordinates in y-direction edit field. 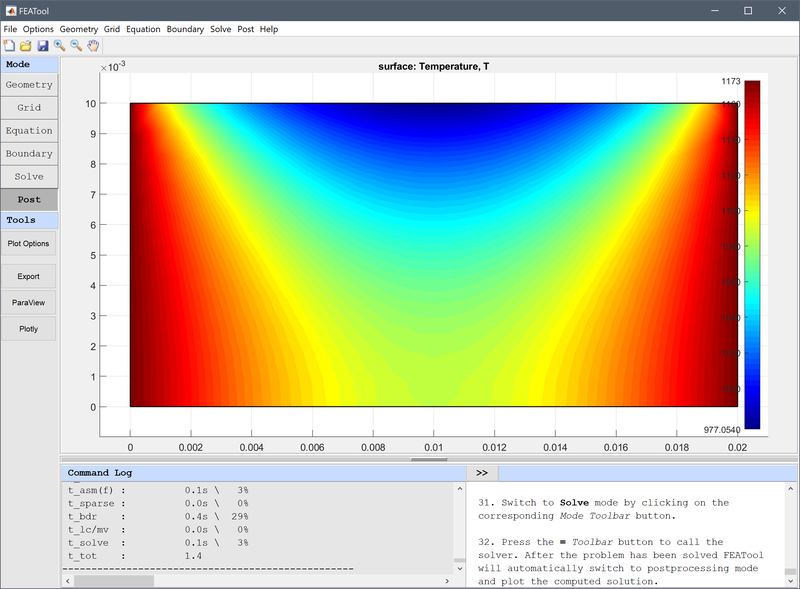 The heat transfer in a ceramic strip heat transfer model has now been completed and can be saved as a binary (.fea) model file, or exported as a programmable MATLAB m-script text file, or GUI script (.fes) file. Holman JP. Heat Transfer. Fifth Edition, New York: McGraw-Hill, page 96, Example 3-8, 1981.